KIEV, Ukraine -- Ukraine needs to hike gas prices for domestic consumers and let its currency trade more flexibly if it wants to get funds flowing again under its suspended International Monetary Fund bailout, the head of a visiting Fund mission said on Monday. With a parliamentary election in October, the Kiev government has baulked at taking IMF advice to raise gas and heating prices for Ukrainian households by 30 to 50 percent, which economists say is needed to put public finances on a more sustainable track. 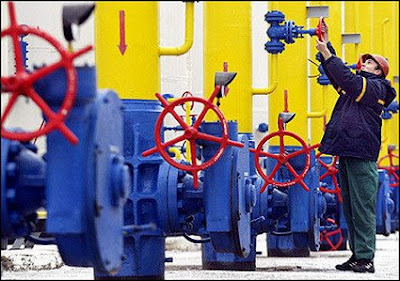 The government hopes to re-negotiate a cheaper price for deliveries of natural gas from Russia to circumvent the problem, though a compromise with Moscow has to far proved elusive and it has forfeited $6 billion in tranches of IMF money in the meantime. Asked what Ukraine would have to do for the Fund to resume its aid programme, IMF mission chief Christopher Jarvis said: "We recommend significant upfront (gas) tariff increases and regular increases thereafter as part of a time-bound plan to eliminate subsidies." On the national currency, the hryvnia, Jarvis told reporters: "We continue to believe that greater exchange rate flexibility can better serve Ukraine in adapting to changing economic circumstances and can provide a buffer for external shocks." The Central Bank's policy has been to maintain the hryvnia at close to 8 hryvnias per dollar through regular interventions on the interbank market. Jarvis warned, however, that this policy would lead to a widening of the current account deficit which was around 5.5 per cent of gross domestic product (GDP) in 2011. "We expect the current account deficit to widen to 6.5 percent on current policy though if policies are tightened the deficit could be lower," he said, adding: "Ukraine still needs to resolve a range of important issues and deal with external and internal challenges." The IMF is Ukraine's main international lender. The ex-Soviet republic has also been helped to plug holes in its budget with a $2 billion loan from Russia's state-controlled VTB, which was due to be repaid next month. Ukraine has said it would seek to raise $1 billion through government bonds to repay part of the VTB loan, and on Friday IFR Markets, a Thomson Reuters news and analysis service, said a group of Russian banks were likely to refinance the rest. Jarvis said the Kiev government had to act on energy policy and especially gas prices to meet its budget deficit target of 1.8 percent of gross domestic product. "When the government is ready to take action in this area the IMF would be ready to resume discussion on the next stage of the (bail-out) programme", he said. Analysts say there may also be pressure for Ukraine to release opposition politician Yulia Tymoshenko, jailed on abuse-of-office allegations that the European Union says were politically motivated, before IMF funding resumes. "After the election I think the chances of a deal are quite high, albeit this might still require evidence of a significantly free/fair election, and/or the opposition are co-opted one way or another into government," said Timothy Ash at RBS. "I would also tend to think that Tymoshenko will need to be freed for key IMF shareholders to back a new program me."